How many times have you wished that you could find a way to make a little money from your 4-wheeling weekend, dirt bike, metal detector, or just walkin' across one of California's desolate dry lakes? Well, if you're observant, persistent and a little bit lucky, there may be some bucks waiting out there in the boondocks, just under your nose...and literally right out of the blue. Meteorites are remnants of other worlds, pieces of comets or asteroids blown apart by collisions with each other or, in some cataclysmic cases, with the earth. These pieces of rock or iron (or both) which survive their fiery plunge through our atmosphere can create huge craters like the one near Winslow, Arizona. This crater, nearly a mile in diameter and 600 deep, was created in 10 seconds, about 50,000 years ago by a 100-foot diameter chunk of iron and nickel traveling about 40,000 mph. This hyper-rock created an unimaginable explosion, most of it disintegrating upon impact, but throwing small pieces over a 12 mile area. There are more than 15 known impact craters throughout the U.S. from which fragments are still being found by treasure hunters, hikers and off-road vehicle enthusiasts. 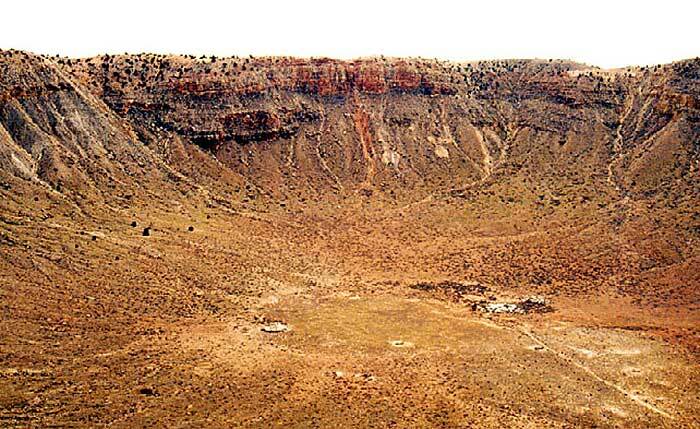 In addition to craters, there are locations where meteorites have exploded or fragmented at high altitude and dispersed pieces over a wide area, known as a strewn field. These zones can cover just a couple of square acres (Holbrook, Arizona) or several thousand square miles (Namibia, Africa). Most meteorites that have recently arrived on Earth will have a dark brown or black fusion crust on their surface, the result of a high-speed entry into the atmosphere. Newly identified falls are of great interest to researchers and scientists who can study the sample before it has rusted or become contaminated with terrestrial pollutants. One of the most famous, if not the most valuable meteorite to be scrutinized by NASA and the news media, was found in Antarctica (Allan Hills) in 1984. After reexamination with an electron microscope it was found to have possible fossilized materials believed to have come from the planet Mars. If you happen to be ice-biking, or 4-wheeling or prospecting near glaciers or ice fields, keep in mind that solitary rocky material is seldom found embedded in ice, and if you see one, it could be a rare kind of meteorite. Some museums and universities have paid from $100 to $5,000 per gram for this particular (Allan Hills 840001) specimen, but most iron meteorites are sold or traded by collectors from 10 cents to $1.50 per gram, depending upon their variety, authenticity and size. Like gold nuggets, the price is determined by the market -- sometimes a feeding frenzy develops over a particular stony-iron, or recently acquired one-of-a-kind meteorite. There are many informative and educational books available to anyone interested in prospecting for meteorites. Two of my personal favorites are "Rocks From Space" by O. Richard Norton, (Mountain Press, Missoula Montana) and "History of Meteorites" by Astronomical Research Network (Maplewood, Minnesota). Swiss Meteorite Lab (Glarus, Switzerland). Much information about the formation of our sun and surrounding planets can be derived by scientists, geologists and astronomers studying these visitors from outer space. Astronomic and geophysical theories about how Earth was created (and will perhaps end) have been derived from the chemical and crystalline structures of the three major meteorites categories: iron, stony and stony-iron. Is it heavier than a normal rock of the same size? Does it attract a magnet? Does it have a dark brown or black crust? If you see a meteorite fall, it's important to record the exact date and time, geographical location, visible landmarks, approximate angle of descent and impact, color, size and shape of the object and whether or not you heard any sounds or explosions. If you find something on a dry lake bed, sand dune or glacier that looks out of place, or your metal detector indicates iron or nickel in that strange looking rock, it's probably worth further investigation and might make you a little richer. BLM - Rules for meteorite hunters 10/01/2012 - on BLM land. Casually-collected meteorites are for personal use only, and may not be bartered or sold for commercial purposes. Individuals or institutions intending to collect meteorites for scientific research or educational use must obtain an Antiquities Act permit through a Bureau of Land Management (BLM) State Office, in accordance with 43 CFR 3. Applications for an Antiquities Act permit will be reviewed by the authorized officer in the BLM State Office with jurisdiction over the Cultural Resources program. Collection amounts allowed for scientific or educational use are specified in the permit and are not subject to the limits (ten pounds) established for casual collection. Meteorites collected under permit must be curated in an approved repository, and must meet the requirements for curation as defined in 36 CFR 79. 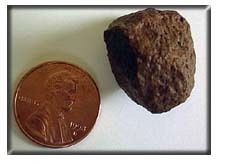 Unless otherwise prohibited by laws, regulations, land use plans or closures, meteorites may be commercially collected by individuals possessing a land use permit issued under the authority of the Federal Lands Policy and Management Act (FLPMA). Land use permits are issued by the local BLM office in accordance with the regulations in 43 CFR 2920. The applicant must pay an application fee, a purchase price based on either a unit price or a percentage of the fair market value of the removed material, and a reclamation fee as appropriate. The permittee must comply with all environmental laws and regulations for surface disturbing activities on public lands. Collection amounts allowed for commercial use are specified in the permit and are not subject to the limits (ten pounds) established for casual collection. Treasure Hunting message board - Enter meteorite in the search box on the top right above the logo.